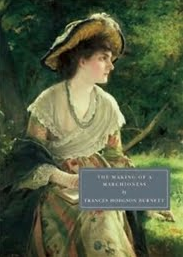 Having recently read and loved 'The Shuttle' by Frances Hodgson Burnett, moving on to 'The Making of a Marchioness' was a natural progression. This is the story of a pre-Edwardian lady, Emily Fox-Seton, who has fallen on hard times and who is left to live in London on her wits, being as she is, orphaned and penniless. She has a small annuity, but is reliant on the charity of well-to-do acquaintances, who allow her to visit them. In return, Emily acts as personal assistant, running errands and helping keep house for these lady 'friends'. The story is Cinderella-esque in genre, as honest, kind and large-eyed Emily dazzles all with her good sense and kindly ways, none more so than the most marriageable bachelor of them all; the Marquis Lord Walderhurst. Apparently a Marquis ranks in between a duke and an earl, and his wife, or widow, is titled, marchioness. Indeed, it is the ranking of the various classes in society, that made this book such an interesting read for me. We witness how marriage allowed a woman skip through many levels in society in one fell swoop and how one's whole family was reliant on one's ability to marry the right man. The 'right' man, in this time period, has nothing to do with Bridget Jones's definition of 'Mr Right', but rather whether or not one's future husband could provide the right credentials to allow you and your future children move in the 'right' circles of society. We hear of the beautiful Lady Agatha Slade whose family seat in Ireland lies in limbo, as there is not enough money to keep the estate functioning, or enough money to pay the debtors and sell up. The family's fate resides with their eldest daughter. She must marry well at the end of this social season, for they cannot afford to send her out in society again, having spent their last penny on her gowns and jewels. It is heartbreaking to read of her despair and to consider how so many young women have been married-off in this way, without knowing love or without reference to their own feelings in any way. So, while the 'Making of a Marchioness' may seem just a simple pre-Edwardian rags to riches story, there is much more gritty realism bubbling away just below the surface than you might think. Indeed, it is the balance between fact and fiction that I found most compelling about this book. Written in 1901, in the late-Victorian period, Hodgson Burnett is perfectly placed to give us a first hand account of what life was like for both ladies and their servants before the social changes that came about with the outbreak of World War One. We witness first hand the dire situation facing cash-poor women who were too gentile to get an actual job and too poor to live in decent society. When Emily begins her ascent up the social ladder, she enlists the services of a ladies maid. She tells the girl that she will pay her a salary of £35 a year, plus beer! This novel is full of such factual detail, that tells us much about life at this time in history. The world of the book seems so alien to us, but we must remember that women did not achieve the right to vote in general elections, until 1928, and while it is irksome to hear how Emily longs to please the men in her life, treating Walderhurst as lord and master, literally, we have to allow that this is a book of its time and move on. In a similar way, we are uncomfortable reading about the servant from India, who is portrayed as an evil 'witch' character. We wonder if it is because of her skin-colour that the ayah Ameerah cannot be trusted? However, Emily tells others in the book not to be so narrow-minded when they reveal their racism. It is interesting to note that some fifteen years later, Hodgson Burnett would return to the world of India, at the start of her novel 'The Secret Garden' and this time the ayahs were shown to be more caring than the child's own mother. The character of Mrs Osbourne is equally compelling. She is an Anglo-Indian girl, born in India of English decent, but who longs for a life in England. Hers is a loveless marriage, unlucky as she was to have been married-off to a cad and a thoroughly bad man. Her family sold her to the devil, thinking that she had made a good match. She is torn between goodness and evil throughout the novel. She seems to dwell in a limbo world, being neither Indian, nor English, neither good, nor bad. In this way, she is surely the fore-runner of Mary Lennox, the Indian-born English girl and the central character of 'The Secret Garden'. The angry Anglo-Indian wife, Mrs Osbourne, would later morph into the angry child, Mary Lennox, and both of them would come to make a home in the strangely soothing English countryside. There is no doubt that there was something in the circumstance of the British colonials living in India which captured the imagination of Hodgson Burnett. The 'Making of a Marchioness' is half of what was originally two books, and the second, follow-up, novel, 'The Methods of Lady Walderhurst' now makes up section two of this novel. Here we continue Emily's story, an enter into a melodramatic tale, complete with a dark brooding villain, murder plots and strange shadows in the dark. The mood is verging on the gothic in this section and delightfully so. Of course, Hodgson Burnett would later perfect her gothic style in 'The Shuttle', a book I urge you to read as soon as may be, but 'The Making of a Marchioness', is a welcome tale to wile away the hours in the golden light of pre-war, pre-Edwardian bliss. P.S. Both 'The Making of a Marchioness' and 'The Shuttle' are both available free on Kindle due to lapse of copyright. Excellent points you make. I loved this book so much, that after reading it in one day, I reread it again the next day. I loved Emily's goodness, but was uncomfortable with her worship of Lord Walderhurst. Your reminder to put it in perspective of the time eased this feeling. When I was rereading the book, I caught some allusions to the scene with Walderhurst at her bedside. It was very poignant. I just downloaded The Shuttle and will read it next.